Today at 3 p.m. we marked the beginning of Ligonier Ministries’ 2010 National Conference Tough Questions Christians Face. 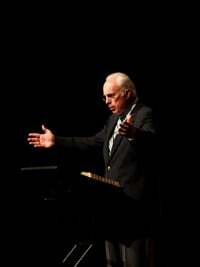 John MacArthur was the first speaker and he began at the beginning, so to speak, with this question: Why did Jesus have to die? MacArthur took as his text 2 Corinthians 5:18-25 and he encouraged Christians to proclaim the message of forgiveness, the word of reconciliation. He affirmed that the issues of substitutionary atonement and imputed righteousness need to be covered over and over until we come to a rich and full understanding of it. This is an issue Christians need to grapple with every generation. The message of the gospel is the message of reconciliation and it tells us that the alienated sinner can be reconciled to God. In fact, Christians have been given the ministry of reconciliation and this describes the purpose of the Great Commission. In order to carry out this ministry, we have been given the Word of reconciliation—we’ve been given the Word in order to carry out the ministry. From the human side reconciliation would be impossible for we could never bring it about on our own. Reconciliation needs to be initiated by the offended party. God has seen fit to initiate reconciliation and has made us ambassadors, messengers, of that glorious message. First, reconciliation is by the will of God. The things that accompany regeneration come from God. One thing that is so distressing about Catholicism is the teaching that you need to go to Mary—that God is harsh and tough while Mary is kind and loving, that God is distracted and aloof while Mary is attentive and caring. But the Bible tells us that God is by nature a Savior and is not at all reluctant to save. Think of the parable of the Prodigal Son. The hero of this story is not the son but the father and we are not meant to ignore the fact that the father is looking down the road, straining to see his son. And, of course, we see that the father runs to his son. This is an amazing thing for even today Middle-Eastern men simply do not run; but this man pulls up his robe and sprints to his son. The father is willing to take upon himself scorn in order to be fully reconciled to his son. Two, reconciliation is by the act of forgiveness. It can only take place if the offended party is willing to extend forgiveness. This is the message we preach: God will forgive all your sins. This is the glorious gospel message. It is all about sin and forgiveness. Three, reconciliation is by the obedience of faith. This is implied in verse 20. This divine work is not apart from the faith of the sinner. We are beggars before God and need to see ourselves this way, to have a right assessment of who we truly are. But a question remains: How can God do this? How can God justify the ungodly and yet be just? God can justify the ungodly by pouring out his wrath on a perfect substitute, on one who had no sin. Christ was wounded for our transgressions, bruised for our iniquities and by his stripes we are healed. God treated Jesus as if he had personally committed every sin by every person who would ever believe although in reality he never committed any of them. He was a perfect substitute. And when Christians go into the world, this is the message we need to tell people, that Christ paid in full for all who would believe. This is why Jesus needed to die.